You and your pet will benefit from our well-stocked pharmacy. We maintain a large inventory of veterinary pharmaceutical products and medications, including flea, tick, and heartworm preventive products. You can rely on us whether your pet requires medication for a chronic medical condition or needs short-term medication while recovering from an illness, injury, or surgery. When you purchase medications from our pharmacy, you can rest assured that your pet?s medications were obtained from safe, reliable sources and stored under optimal conditions. 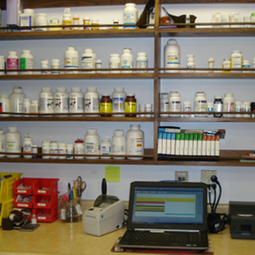 Our trained staff will fill your prescriptions with care as well as attention to detail and your pet?s specific needs. You can count on us to provide you with accurate information about your pet?s medications, including proper dosing information, and to alert you to any potential drug side effects or interactions. We are also here if you experience any problems with your medication after you return home. Help is only a phone call away! Closed all major holidays. If you need immediate assistance during that time call 262-542-3241.